I mourn the passing of Leonard Nimoy, the actor who brought depth and integrity to the role of Mr. Spock in the classic Star Trek series and films. I grew up on Star Trek reruns. The show helped me formulate ideas about writing, as well as life. It was an enthusiasm I passed on to my kids. …and family fun has been inspired by Star Trek. Leonard Nimoy co-wrote and directed Star Trek IV, The Voyage Home, which was my favorite of all the Star Trek movies. His vision for the story was to have “no dying, no fighting, no shooting, no photon torpedoes, no phaser blasts, no stereotypical bad guy.” It was funny and quirky, and didn’t take itself too seriously, yet its message was important– advocating protection and conservation of our world and its creatures. There was much more to the man than Star Trek or Mr. Spock. He was the son of Ukrainian Jews, he spoke and wrote Yiddish, was a photographer, a poet, and a man of principle. According to NPR, when he found out that Nichelle Nichols wasn’t being paid as much as the other actors on the show, he protested on her behalf. When he found out that she and George Takei were to be excluded from the animated series, again he went to bat for them and they were hired on for that series. He lived long and prospered, but he also lived well. Click here for more interpretations of The Weekly Photo Challenge: Reward. Living long and prospering he did so well. Indeed! Thank you for the visit, Carol. I’m glad you got to watch Star Trek too! Thanks so much for stopping by. So true, Nia! He certainly made his mark upon the world. Best wishes to you. Oh, the Stark Trek series on TV is part of my childhood too. I live in Germany, and Star Trek was broadcast on Sundays at 6 p. m.
When I was a child, I had to take a bath a 5 p.m., and then I was allowed to watch Star Trek. And I had a crush on both Commander Kirk and Mr. Spock. Thank you for sharing your memories. When I was a child the reruns came on at 6PM on Saturday night, and even my mom would watch with us. I never noticed his ears before! Now that you mention it, I see what you are talking about. That might be because he was so old. 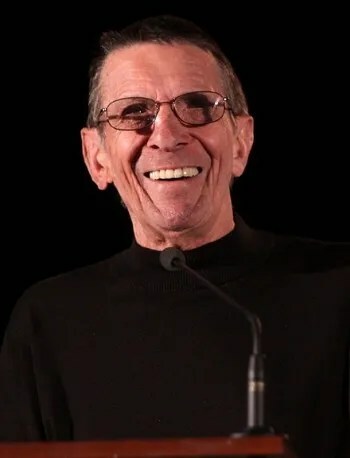 People’s ears and noses keep growing as long as they live, and I’m glad that Leonard Nimoy lived long (and prospered), and so did his ears! Husband was a huge fan of Star Trek and I watched it too, but by the third or fourth viewing, I begged off. Leonard Nimoy seems to have lived a good life – I remember no scandals or ill winds blowing about him. I never heard a bad word about him. One of the saddest things about Classic Trek was the way Wm.Shatner resented sharing the spotlight to the point where he would insist people get written out of the show rather than share a moment of his screen time. How different it would have been if a kind and generous man like Leonard Nimoy had captained that ship! He certainly stood up for them when he could. Thanks for the visit, Carol, and for sharing your story. I’d gladly have shared an episode or three with you all! I read both of his biographies and was blown away by how accomplished he was and how he came to terms with the Spock character. He was so much more than an actor and the media does not do him justice for it. Great post idea for this week’s challenge! I’m sure you know more about him than I, but am glad you cared enough to do the reading. I think I shall do so as well! Live long and prosper, dear friend! I too mourn Leonard Nimoy. I grew up on Star Treck it’s first time round! hehe I had a huge crush on Dr Spock as a kid. Sad to know he’s gone. I think Mr. Spock’s popularity took everyone by surprise. They tried to make Gene Roddenberry write him out of the show, but he trusted his instincts and refused. Good thing too! Imagine a world without Mr. Spock, at least in the Star Trek universe. Thank you for this tribute! I, too, thought of him today with appreciation and respect. I was not the fan my oldest sister was, but I did absorb some of the postures (my LLAP hand gesture is perfect!). I was rather shocked to learn that he was 3 years older than my mom…I suppose he was frozen at his peak in the reruns I saw as a teenager. I thought he was maybe 10 years older than I! HI Scilla, I remember when the series came on–probably before you were born. I was a little too young to watch it, but the reruns started almost as soon as the show went off the air, and I was there all the way. My husband and I went to a play last night and we talked about actors who seemed so old when we were kids, like Ray Walston of My Favorite Martian. He was probably in his forties when he made that show! Your perspective certainly does change with time. Strangest of all is to see photos of your parents when they were all grown up, but so much younger than you are now! I know what you mean. I had a friend write to offer condolences and had to go look it up. I’m sad for him, and also because it feels like the end of an era. It certainly dates me! Thanks for saying what I’m feeling, and adding facts I didn’t know. Hugs. Thank you for your very kind response. There is a great interview with Leonard Nimoy that was recorded at the Yiddish Book Center, where Bea studied the summer before last. Unlike with many celebrities, the more I learn about Leonard Nimoy, the more impressed I am. He was a graceful man with many layers. I loved him and the character he created in Spock. Your post is a fitting tribute Naomi. Have wonderful weekend in Seattle – one of the few snowless places in the country these days! Thank you for a very thoughtful response. After rain all week, we are electing some sunshine this weekend. I will have to make myself go out into the garden and do some fall cleanup! I hope you have a good weekend too! That’s so interesting! He got his start in Yiddish theater. I heard him in an interview done at the Yiddish Book Center–http://www.yiddishbookcenter.org/Leonard-Nimoy–where my daughter studied Yiddish, and it’s very moving. Do you know where your family came from? My grandmother was from Odessa and my grandfather was from Kiev. yes, we(my mother’s parents) came from Kishinev which is now part of Moldova. I think it used to be part of Ukraine but not sure about that. my father is from Romania. I will check out your link, thanks! Thanks for sharing your family story! This is a great tribute! I liked him too in Star Trek series. Thank you, Ruchi! I appreciate your visit, and you sharing your thoughts. I remember we were staying in a condo in Hawaii and we were playing quietly while their dad slept in. We had our art supplies, and I made them Star Trek paper dolls. Bea’s favorite character was Sulu (hence the yellow shirt!). All they needed was a bit of paper and imagination, and a story that inspired them. Thank you for the visit and your very kind words–so good to hear from you! I didn’t know he died. I never watched the show, but he was certainly an iconic figure and actor. He certainly was. I never had a crush on him or anything like that, but I felt that he was an interesting character in a show that was ahead of its time. Thanks for visiting, Juliann. Naomi, this was such a wonderful treat of a post. I love the way you included that he was so much more than Spock. His deep and caring ‘old soul’ was truly such a wonderful man. I used to have the two poetry books, but when I had to downsize my books, I sadly let them go. 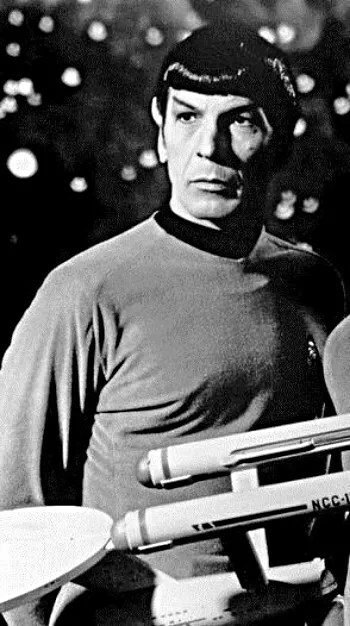 This was also a very handsome photograph of Leonard Nimoy. Thank you for this very well written tribute to a fine man. Wow! Robin, you had his poetry books?!? I will confess that I have a couple of LPs of Leonard Nimoy–I never did get rid of my vinyl collection. Thanks so much for the visit, and for sharing your own thoughts and story. Naomi, I also am proud of his advocating for his cast members and thus, friends, to have better pay checks and be included in the animated version of “Star Trek.” Those truly show Leonard Nimoy’s character. Yep, my Dad loved “Star Trek,” so when he heard that L. NImoy had written poetry, he went and bought the books and gave them to me, Naomi. That would be tough to have to pick and choose. I have had almost thirty years to accumulate books and things, and if I ever have to leave this house, it would be very traumatic. When the kids move into their own places, I can furnish their houses/apartments just from what we have in our house. P.S. Pretty sweet of your dad to run out and get you those books! indeed!! He was a rennaisance man!! So true, Cybele! Thanks for stopping by and sharing your thoughts. 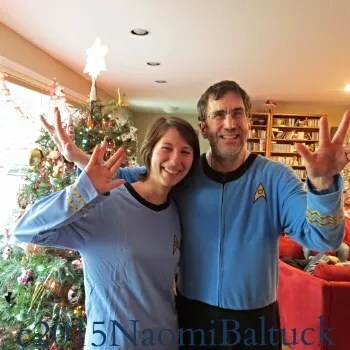 What a lovely tribute Naomi – how many of us have been entertained and entranced by Mr. Spock. Sad that we are only now learning how much more there was to the man than the images we saw! Thank you, Tina. That is too often true, but he had an enormous following and– unlike some celebrities– I have a feeling he felt sufficiently adored and admired, as he also seemed to be a kind and modest man, and certainly was one who didn’t feel like the world should revolve around him. your gallery made me smile, Naomi, yes he became a part of life and jokes in many families! Thank you for the visit. I know, especially when Leonard Nimoy was younger, he considered the world’s strong association of him as Mr. Spock a mixed blessing. But it is because of Spock that he was known and recognized throughout the world. My mug at work says my name on one side and Spock on the other. I never watched all of the original series. My parents have the Next Generation all on DVD, and that’s where I started. I watched Voyager and Enterprise in the mornings before school, reruns recorded off the TV in which the advert breaks were opportunities to grab my breakfast or brush my teeth. Deep Space Nine I borrowed from a friend. I watched all the films though, and there is something ever so beautiful about the story in the Voyage Home. It was definitely the family’s favourite of the original series films. Until you pointed it out I’d never thought about the lack of violence in it. I feel compelled to read his autobiographies now. I loved him too and I mourn the end of an era along with you. A beautiful and fitting tribute Naomi. Thanks so much for the kind words. What is really remarkable is that not just our generation, but several generations have come to age since Leonard Nimoy starred in the original Star Trek. So many old shows come and go, but Star Trek is a cultural phenomenon! Well said Naomi, ‘He lived well’ is the best compliment a man could have. I can’t say I was that taken with the series – it was long ago for me – but do I recall the episode where the logical, emotionless Spock was seen to shed a tear? Oh, the writers loved to do that to poor Mr. Spock! I think part of the appeal of his character was the obvious struggle between his human and Vulcan side, which we plain old humans could relate to, because we have to deal with that every time our superego and id have a go at each other (at least, according to Mr. Freud). I would love to handpick a half dozen or so of the best episodes–some of them weren’t great, but there were many very good ones. You might have tuned in to some of the less stellar episodes. 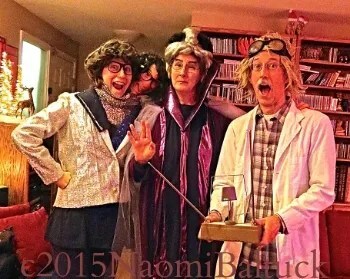 Best tribute to Mr. Nimoy, Naomi. The story of his going to bat for his colleagues is something I didn’t read before. 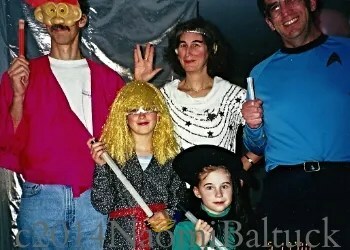 Love the photographic history documenting you and your family’s enthusiasm for Star Trek over the years. Thank you for sharing your perfectly titled memorial post. Thanks so much for your visit, Ruth, and for your very kind response. We are all a little sad in our family, for the man, and for the end of an era. Thank you, Paula. May you and yours LLAP! actor, director writer and photographer . He was one of a kind ! Hi Jane, thanks for the visit, and for taking the time to comment. I hope you are well and enjoying this amazing weather! It’s really interesting to note what affects us and makes an impact for the rest of the lives. I didn’t grow up with Star Trek and have really no emotional ballast going in that direction. Of course I have tried to watch some of it later on, but then there wasn’t any magic in it for me. 🙂 It’s still a sad loss. I once read that the music we listened to while we were on the cusp of young adulthood is, for the rest of our life, what we tend to prefer for comfort or relaxation. I love music of all kinds and from many cultures, but now and then I will take particular satisfaction, and even comfort, in listening to Motown, The Clancy Brothers, my mother’s folk collection, or top hits of the 70s. I suppose Star Trek has served that purpose for me as well. Thank you for a very interesting and thoughtful comment. By the way, I took a wander over to your website, and your photography is outstanding! I hope you get some visitors from it! Thanks so much for your very kind words, and the link to your blog, featuring the five day challenge. I loved the story you told today, and the perfect pairing of the photo. I look forward to more story time, dear friend! You are more than welcome, Naomi! I do like sharing story time with you! As a kid I practiced until I could raise one eyebrow. He brought so much joy to so many people. What a lovely tribute to an actor and person we all valued so much. 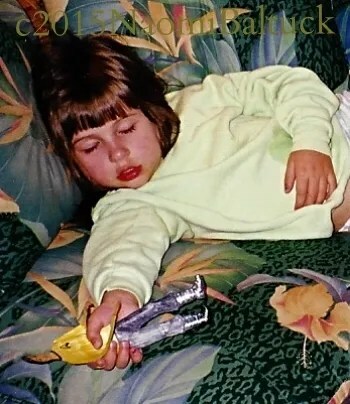 Oh, my gosh, Laurel, so did I! I know, for instance, that it’s much harder for me to raise my left eyebrows than my right. Thanks for the visit, and for sharing your kind response. LLAP, my dear. I too am a right eyebrow raiser! LLAP back at ya! Naomi – for some reason I feel like i have left a comment here on this post before – but maybe I just read it in the reader and did not – either way- I do not know very much about star trek and over the summer I am hoping to do some binge watching to get a feel for this show that has remed to impact so many folks – I am not sure where to start and I will do a little homework later (unless you have a tip on where to start) but I follow a few other blogs that have talked about trek and I want to see why they love it so much. I don’t live and breathe Star Trek, but I love it. It’s been a big part of popular culture for fifty years, and I have drifted in and out of it over the course of my life, as work and family allowed. For instance, I never watched The Next Generation until I was up at 3AM every morning with a colicky baby, and to stay awake while rocking and holding the baby, I watched late night reruns of the series. Familiarity with ST would help you get references (like knowing Shakespeare, which is constantly quoted and referred to in other arenas). I would start you out with the classic series, so you know where these other shows are coming from, and it will help you understand the occasional reference to the characters in the newer series. Unlike many, The Next Generation wasn’t my favorite of the ST series, although there were some excellent episodes, and I liked Captain Picard, who didn’t automatically resort to fisticuffs or sleep with every female alien he met. I loved Voyager for it’s strong woman Captain Janeway and a compelling underlying mission to get home, although that wasn’t as popular a series for many fans. I didn’t care for Enterprise –to me it felt half-baked and contrived, a desperate attempt to have at least one Star Trek show on prime time after Voyager and DS9 went off the air. Deep Space Nine is different from all the other series–darker, with a continuous story that builds on itself. It is more sophisticated, set in a world with more gray areas than the squeaky clean universe of The Next Generation. It should be watched in order from episode one, as it is difficult to jump into randomly. As with Next Gen, it takes a season or two for the characters to hit their groove. I think DS9 overuses Ferengis, a buffoonish alien species, and in a few episodes I feel that they become tedious cartoonish caricatures of themselves. Captain Benjamin Sisko is probably my favorite of all the ST captains. None of these series is perfect–I am a writer and my tendency is to analyze and critique, and I’m sure there are fans who would disagree with me–but I do love the world they have created. And I believe that Leonard Nimoy was golden, and lent his dignity and class to the franchise (with the exception of two really awful classic episodes–Galileo Seven and Spock’s Brain– and again you will find fans who vehemently disagree with me here). Sci-fi just doesn’t appeal to everyone. If you enjoy it, I also highly recommend watching a series called Firefly, written and produced by Josh Whedon, starring Nathan Filion. It is excellent, again delving into a future that isn’t so squeaky clean, with plenty of gray areas, lots of intelligent humor, quirky and complicated characters. (I could tell you where I disagreed with choices made by those writers too, but I still love that series, as much as I love ST). I’ll stop there, because I’m sure that’s more info than you really wanted, but If you are serious about watching some Classic Trek, I will give you the titles of my favorite episodes. Naomi – wow – you really made my day and I cannot thank you enough. I will be back in touch later to get a few episode suggestions (do you mind if I email you) but this is outstanding. When my spouse saw that I had “watch star trek” on my to do list for this year – he started to laugh (in a good way) and then he told me that I am going to have to decide where to start – he knows very little – but he does know that there are differences – and I think his good friend is a Next Gen fan (so I soaked up every word here) – and I agree with you that I have heard ST comments/phrases that I just do not get – and so my dabbling this summer may not give me all of them – but I am sure a few…. My very first music album ever was all sung by Leonard Nimoy. I no longer have the album or remember the title of it. My older sister gave it to me as a gift, figuring I was too young for the pop songs of the day. I played it many times. Thanks for stirring up the memories, Naomi!